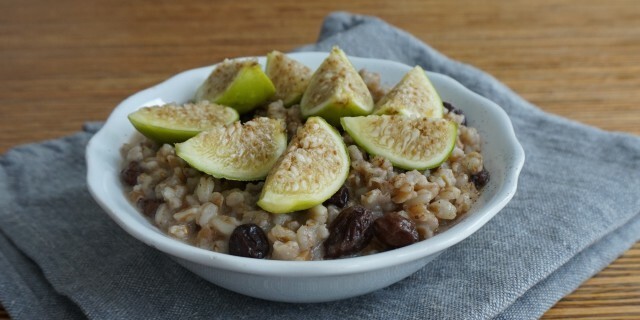 This creamy and nutty Vanilla Green Fig Spelt Porridge is a simple, deliciously warming breakfast the entire family will enjoy. Pearled spelt has a delicious nutty taste and a lovely chewy texture. Pearled spelt has been polished to remove the bran resulting in a creamy-colored grain. It cooks faster than whole spelt and also has a softer, less chewy texture than the hulled variety. When cooked, the grains plump up to almost twice their size. Pearled spelt is a great alternative to rice for ‘soft’ dishes like porridge, risotto and soups. It’s rich in fibre, protein and minerals like iron and manganese. Gently heat oil in a small sauce pan. Add the washed and drained pearled spelt and stir until the grains are coated with the oil and give of a nutty aroma. Add the coconut milk, raisins and water and bring up to a boil. When the spelt has reached a boil, reduce heat to a low simmer, cover, and continue to cook for about 20 minutes or until the pearled has a soft and chewy texture. Just before serving add the vanilla powder. Serve with fresh green figs and maple syrup to taste.